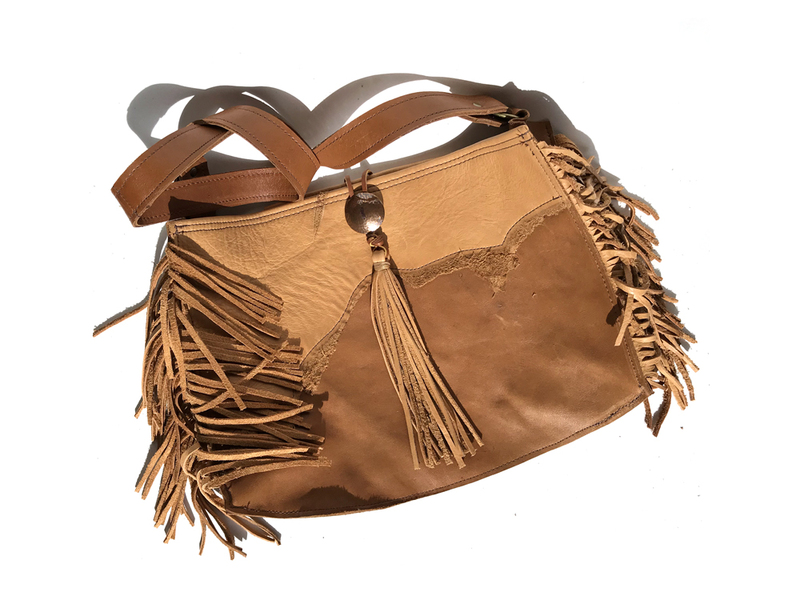 A truly one-of-a-kind handmade purse featuring two-toned camel and tan leather, with the raw edge accent on the front piece. It also features a handmade brass button on which the tassel hooks over for a closure. This one-of-a-kind purse is 13″ wide at the base, 9.5′ tall, and 3″ wide. The strap is a fixed 30″ long. It is unlined. Hand-picked genuine leather selected and paired for a truly unique and one-of-a-kind piece, sewn on a vintage heavy-duty sewing machine, and finished with hand-cut leather fringe, a handmade brass button, and a hand-stamped plaque.